I mentioned in a previous post that I had ridden in something called The Poker Run from Kathmandu to Pokhara and I found out when I was signing up for the event that some of the guys who run it were planning on a ride up to Muktinath the day after the event finished in Pokhara so they invited me to join them, which turned out to be a major blessing. As a foreigner I needed two permits. One was called TIMS and the other was for the Annapurna Conservation Area. In total, as at April 2014, the permits cost a total of $40 and were easy to get in Pokhara. The hotel sorted them out for me but I think I could have got them cheaper directly from one of the travel agencies around the area. You needed 2 x passport photos and that’s it. 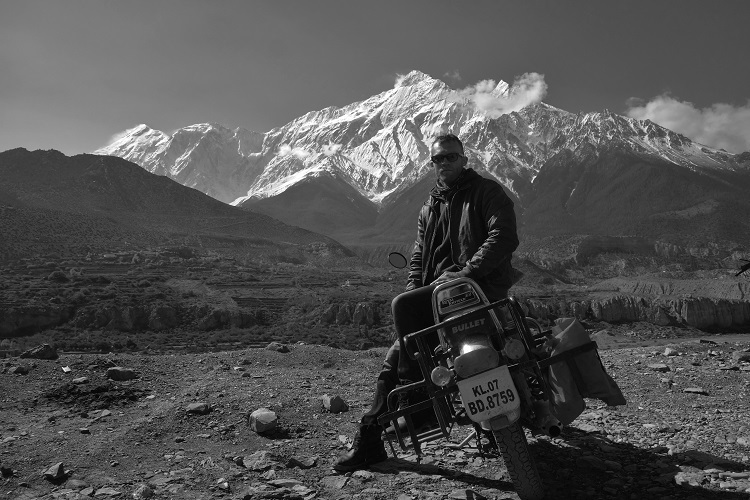 We set out from Pokhara on the 15th April with the aim of getting to a place called Jomsom on the first day, which would allow us to reach Muktinath and back to Jomsom on the 2nd day, before heading home on the 3rd day. That was the plan, anyway, but things don’t always go according to plan…Especially not when there are 5 people on motorbikes, practically riding off road on bikes which are big, heavy and built for only on-road! The road from Pokhara for the first 70km is nice winding so you can cruise along at 60-80kph. After that, at a place called Beni, things change quickly. The road becomes less road and more dirt track and starts to climb quickly at times. 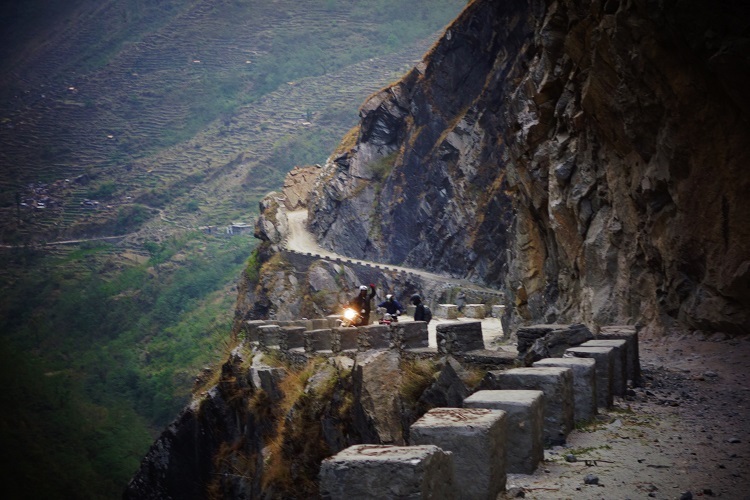 The road has large rocks all over it, wedged into the ground forming sharp edges which you don’t want to ride over but sometime can’t avoid. We made it quite a way up the road, through some tough conditions and then we had a problem. Saqil’s bike wouldn’t work properly and continually stopped. In the end we spent around 3-4 hours attempting to fix it and using a small number of tools to do the job. We continued to make progress albeit very slowly until finally the bike gave up completely and was not ridable. In the distance we saw a bus coming towards us. It’s hard to understand just exactly how a bus service operates between the towns up there along that road but they do. The bus was empty and we needed to get the bike to the next town so after removing some of the parts from the bike we managed to fit it, along with Saqil, into the bus. for a beer in a local, little stopover place. It was hard riding, and that wasn’t because of the beer! I couldn’t see too far ahead as there was zero light apart from my headlamp. I had times where I was having to put both feet on the ground and pull away up the hill in first gear in order to make it up the hill. It was really steep! I got completely stuck in one area where the ground was just a mud pit but I hadn’t seen just how bad it was because it was dark and I was the first one riding up the hill. Still, we managed to get outselves out of that with some pushing and made our way up to a place called Lette where we stopped at a place that Saqil’s good friend ran with his family. It was a really nice hotel and restaurant so it was very comfortable to stay there. The next morning we organised another bike for Saqil from another of his friends, it was an off-road bike and much better suited to the roads that we were riding on. After that we set off to Muktinath with the aim of coming back the same day to Lette. However, with all the photo taking and stops for food and drink we ended up getting to Muktinath pretty late, so we decided to stay the night near to Muktinath. It was a good job really because at around 5.30pm it started raining and we found ourselves a place to stay for the night. The hotel name was Dragon Hotel. In Muktinath there is a temple so we visited that and also Bob Marley’s guest house. I don’t think it was officially his to be fair. The weather up there was very cold. We were only at 3,800m but I was shivering it was that cold. It didn’t help that my boots had become soaked from going through the water and stopping in it! We stayed the night on some makeshift beds at the Dragon hotel because it was full. It turned out quite well actually because it only cost 200 for the night each and the beds were warm and comfortable, albeit all of us sleeping in the living area, but it was a large one. The hotel was near a place called Kagbeni. The next morning we awoke to some amazing views because the clouds had cleared and it was a clear blue sky with perfect sunshine and high mountains surrounding us. It was really nice to be there and I kind of wished that I didn’t have to leave that morning. I would like to have stayed a while longer, but I know that I will be going back that’s for sure, but next time on an off-road bike! 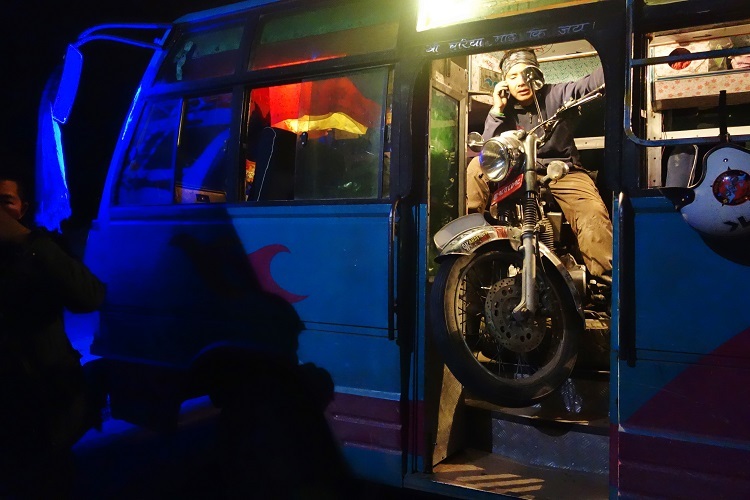 When we reached Lette where we had left Saqil’s bike we managed to organise a truck to deliver his bike back to Pokhara to a place called Bullet Basecamp which is where a mechanic called Raju works and he knows his stuff about Enfields. We made our own way back to Pokhara which took a total of 14 hours which included a few stops along the way. A long ride but definitely an amazing trip and I met some great people along the way, including: Manish, Saqil, Anew, Hec Tor, Gatty, Sonam. Sir, could you please tell me in which month you had this trip? and how far we have to go from muktinath to reach the snow covered area ? Hi Ankit, sorry for the delay in replying. I did this trip in April. I have no idea how far you’d have to go to reach the snow covered area. Hope you have a good ride.